We left Signal Mountain Lodge this morning and headed north to Yellowstone. We chose the Evergreen Motel in West Yellowstone for our base on the west side. This was new lodging for us to experience. It is an older motel just off the main street and right in the town of West Yellowstone. Our room had a kitchenette and was large enough for us. It was off the road far enough so that it was not noisy and parking was just outside the room. The Evergreen Motel is one of the more economical choices in West Yellowstone. Moose Falls The location of Moose Falls is just north of the Southern Entrance to Yellowstone Park. We had driven by many times, but usually it was earlier in May and it was still snowy. This time we stopped! It’s not a large falls but in spring it’s running full and you can get down to the base of the falls. At the top of the falls, was a large sunny rock, and we hoped to see an animal posing, of course. The best we could do was a small marmot popped out to sun himself for a few minutes. Firehole Canyon Drive There is limited parking here, but it’s a great drive and a great way to connect with nature. The Firehole River flows through this scenic canyon and there are usually a few tourists taking a dip here. The road is one-way so that makes it a little safer but it is a narrow road. Close to the end of the one way drive is a lovely waterfall. Afternoon sun hits the cascades and provides nice photos. Moose Crossing The best moments of Yellowstone are the unexpected ones. One morning we were leaving the cabin and spotted movement along the creek. There was a Mamma moose and her baby crossing the creek. The baby was not really strong enough to battle the fast flowing creek and was swept downstream a few times. 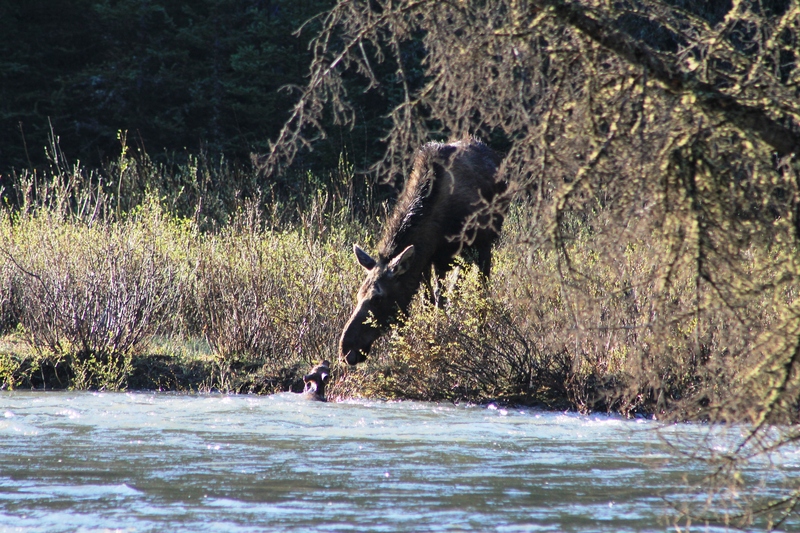 There were several moments when the baby moose was fully submerged. I was panicked!! When the baby finally reached the far bank of the creek, it was at a high bank and struggled to get on shore. The mamma was keeping close watch, but couldn’t really help her baby. At last, the mamma started to walk away and when baby moose saw her protector and food source leaving, she gave a final lunge and made it up on the bank. WHEW!!! There’s nothing more delightful than seeing a bear (or bears) in Yellowstone. In the Spring there is an added bonus for the chance to see cubs. 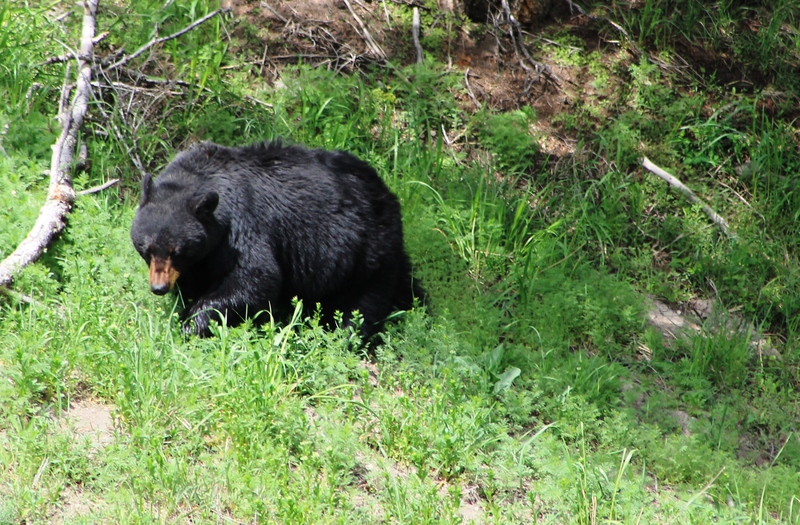 We followed the very well known Tower black bear with three cubs one day for four hours. Initially, the mamma bear was out grazing and the cubs were safely tree bound. Later, the mamma took her cubs across the road away from the growing crowd. We waited patiently for the cubs to reappear, but alas, gave up to try another day. NOTE: Three days later we watched the Mamma bear and cubs for 5 hours…so much cuteness!! Madison River This winding river flows from West Yellowstone out towards Madison Junction. We have always seen bison along here and several times have watched them cross the river. There are multiple roadside stops for photos and picnic tables along the way. 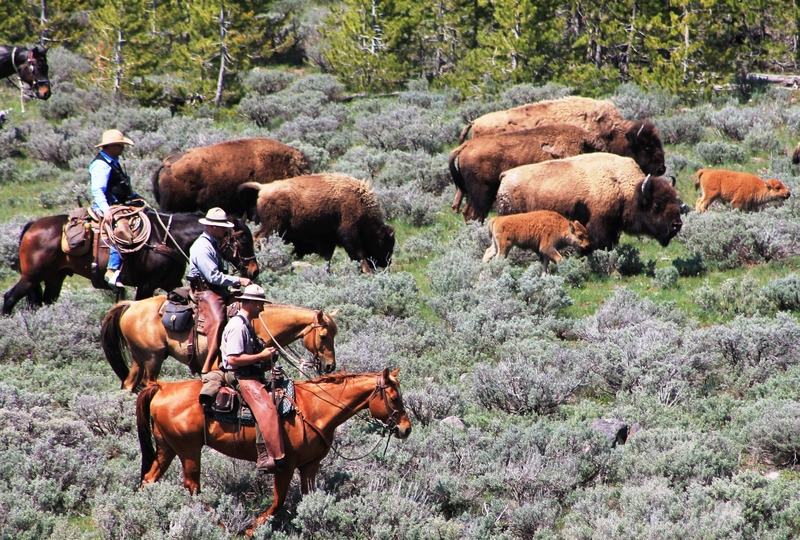 This year we were fortunate to see a Ranger bison roundup along the Madison River. It was quite a sight to see all the bison moving along the river, especially with the red dogs (baby bison)! We spent the morning in the park and then for our next adventure, we drove over to Silver Gate, Montana where we had booked a cabin for the next week. This was our first stay in a private cabin and the location was an ideal one mile drive from the northeast entrance. The cabin was located on one acre of secluded, wooded land, bordering on National Forest land. 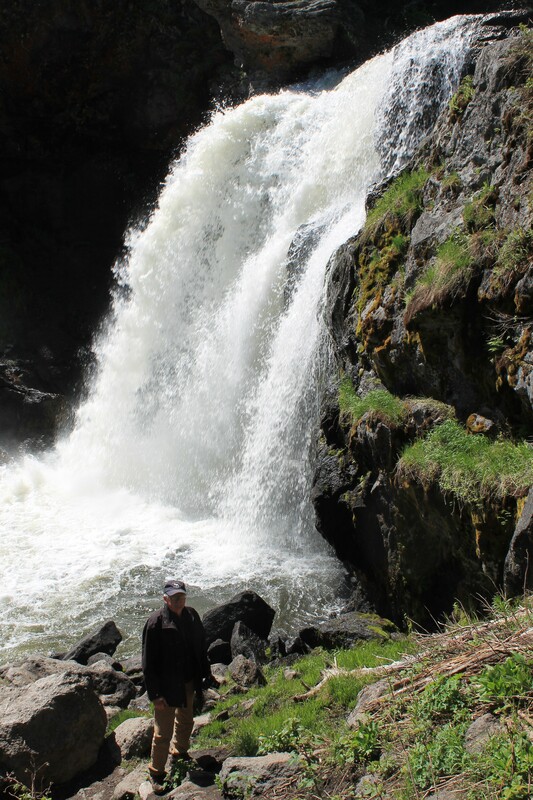 There is a very short hike from the cabin to a 40 foot high waterfall. There is also the adjacent Bannock Trail into Cooke City. The location and cabin were perfect for a great week of wildlife watching and relaxing in our mountain retreat. Trout Creek Hike The trailhead is located along the main loop road about 11 miles from the northeast entrance and just west of the Pebble Creek Campground. I’ll call this a short vertical climb instead of a hike. It’s about a half-mile of steep uphill climbing and I was glad to have my trekking poles. From my research of Trout lake, other hikers reported seeing otter, bison, bear or moose along the way or at the lake. We kept watch and carried bear spray. The views were lovely and the walk around the lake is easy but a bit muddy. We were fortunate to see a bear and a group of pronghorns while we were at the beautiful Trout Lake. This waterfall was accessible from our cabin after a 15 minute walk down the Bannock Trail. 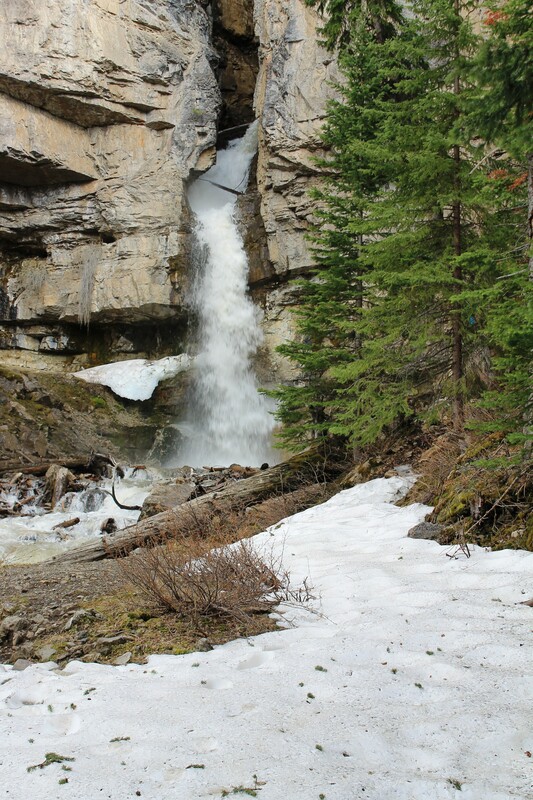 Bridal Falls plunges for 40 feet into a small pool and then flows into the Wyoming Creek. The trail was rocky and there was heavy timber in the area. We climbed over several fallen trees and kept a sharp lookout for bear activity. This area is heavily posted. The falls were fast flowing with snowmelt and quite impressive. This scenic route is designated as an All-American Road. Though we had travelled across the Beartooth Highway before, we had never made the trek in Spring. The Highway usually opens just before Memorial Day, but can close anytime for snowy or stormy weather. From Cooke City, the Beartooth is immediately scenic, and continues to climb as you head north. 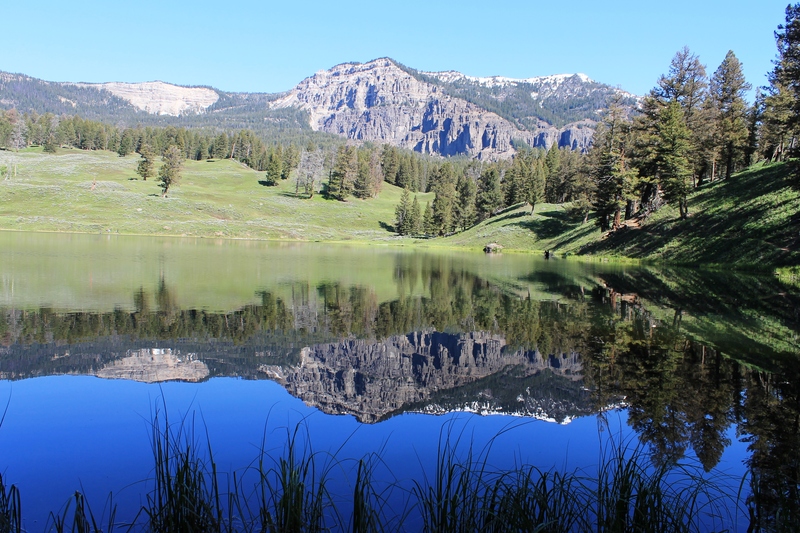 This alpine drive gives each visitor a glorious sweeping view of the high alpine lakes and mountain vistas and of course, the namesake “beartooth”. At the end of the Beartooth Highway is the western burg of Red Lodge, one of our favorite towns to visit. You can read more about Red Lodge here. Our starting point for this drive was Red Lodge, Montana. The 46 mile Byway is noted to closely follow the path that Chief Joseph and the Nez Perce tribe took to try to escape the US Calvary. The winding Byway passes through scenic valleys, rivers, and canyons and crosses one high pass at over 8000 feet. 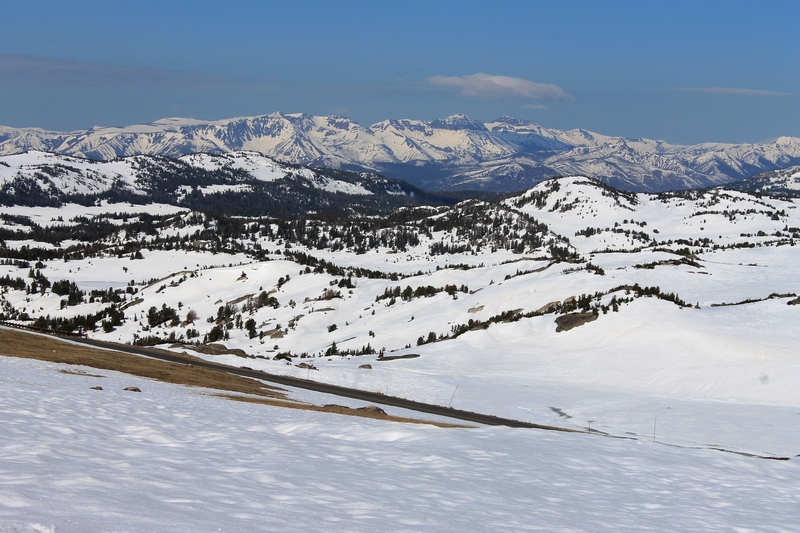 There are historical markers along the way and outstanding views of the Absaroka Mountains. We were fortunate to be here in an early summer setting with the hillsides below the mountains covered with wildflowers. We reluctantly checked out of our lovely Silver Gate cabin and got back on the road for more adventure. We spent the day in Yellowstone concentrating mainly on the north and eastern parts. The Roosevelt Lodge To add to our Yellowstone experiences, we decided to stay for a couple of nights at the Roosevelt Lodge. We usually depart Yellowstone by June 1 and this was the first year that we stayed long enough for the Roosevelt Lodge to open and accept guests. We booked a Frontier Cabin since with this lodging you did not have to walk a path to a shared bathroom. The cabin was charmingly rustic and we enjoyed the western setting and the rocking chairs at the lodge. Hike to Lost Creek Falls from Roosevelt Lodge Since we were staying at the Lodge, we looked around to find some hiking. The trailhead for the hike to Lost Creek Falls was just behind the Roosevelt Lodge. The short hike to the falls starts on the longer Lost Lake Trail. It’s a nice walk through the woods and ends at the 40 foot Lost Creek Falls. 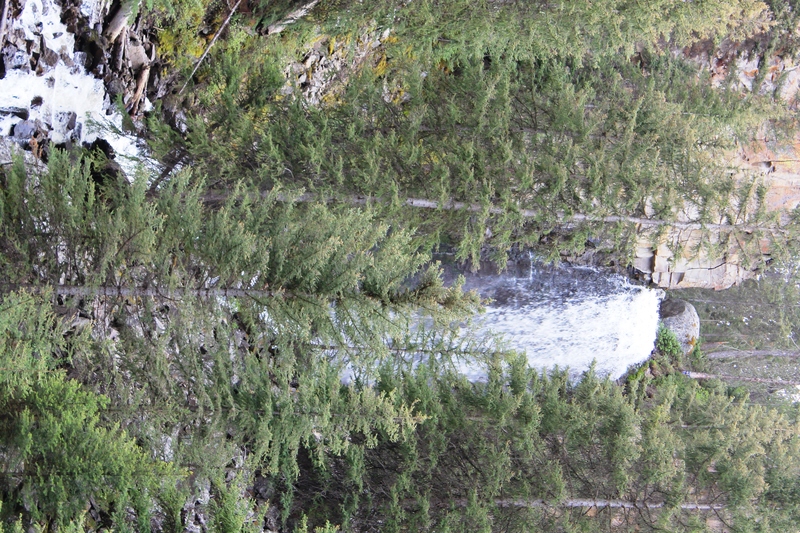 The falls is surrounded by a box canyon with standing and fallen pine trees in the foreground. This hike is a good way to avoid the entire day of driving and spend some time visiting nature!! Hike to Lost Lake from Petrified Tree Since we had found Lost Creek Falls, we decided to try to find the easiest way to get to Lost Lake. One of the trailheads to this lake can be found at the Petrified Tree. We parked at the Petrified Tree parking area. A level trail heads southeast along the floor of a shallow valley, reaching the end of Lost Lake after 1/2 mile. We were a little nervous about bears along this trail since we knew they were frequently in this area. The day before we hiked, we saw a black bear just by the trail. Ranger Ray told me that we would be okay, but try to pick a time when others are also on the trail. The trail is well marked and along the way we saw wildflowers and one lone bison. Best way to spend time in Yellowstone Since we have visited Yellowstone many times, one of our favorite ways to pass an afternoon is to find an off road spot to park. We have snacks (lunch) in the car and just let the park come to us!! 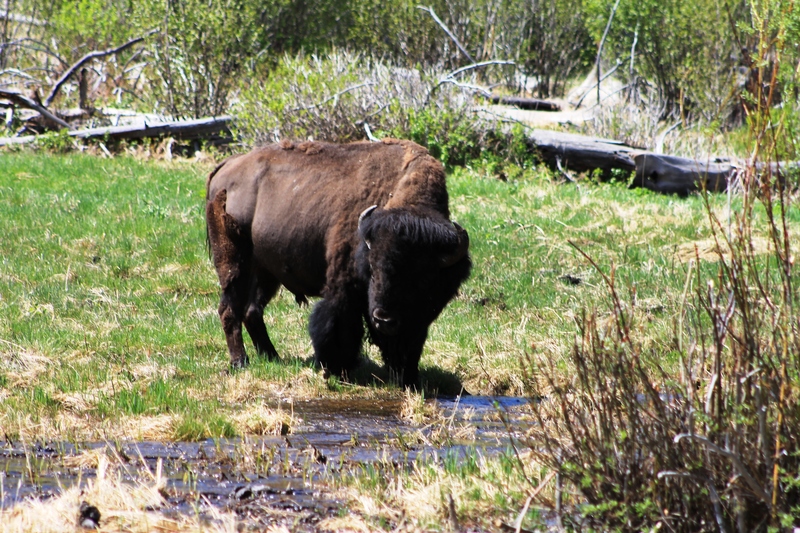 We may wander a bit but often if you just have a little patience, the essence of Yellowstone seeps into your soul and the luck of a wildlife sighting occurs. 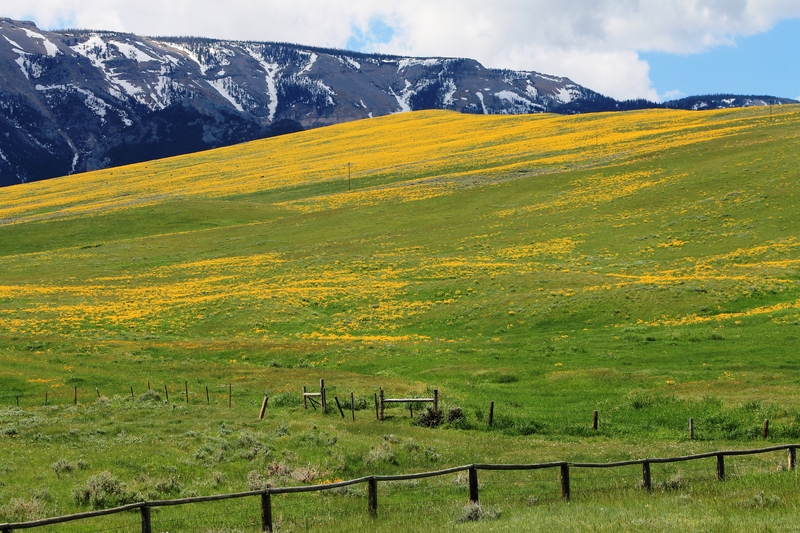 Spring is a truly remarkable time to visit Yellowstone. You are so close to nature that it almost takes your breath away! We had the privilege of seeing the baby moose learn to cross the river and the total delight of seeing Mamma bear and her three cubs multiple times. We also had great timing in the Mammoth area to arrive two minutes after the birth of a baby elk. We watched for about 30 minutes while the newborn struggled to stand. He fell on his head and on his side several times, but never gave up until he finally wobbled on all fours to his Mom. In Yellowstone, you witness the total life cycle. We also had the sad honor of seeing the last day and last walk of a 22 year old grizzly bear. The natural circle of life is stunningly evident as you take in all the scenic wonder around the home of each species. From Albert Einstein…Look deep into nature and you will understand everything better. Great trip report! We won’t have as much time in the park as you but hopefully we will be treated to a sampling of the nature that you experienced. So glad to learn that the baby moose made it across the stream!